This simple, easy-to-use video management software supports monitoring systems with up to 288 cameras, which is ideal for common applications such as retails and banks. The SOW-S Series is the first 4K-ready VMS application from Sony with 4K recording and playback capability. It's ideal for use with Sony 4K cameras, supporting unique image output functions like Intelligent Cropping. Recording 4K image data with four times the resolution of Full HD, the SOW-S Series supports more effective, efficient video monitoring by providing excellent situational awareness plus the ability to recognise fine details in a scene and quick, accurate searches. Multiple users can simultaneously and securely access live or recorded video via their smartphone or tablet from any location. In addition remote PC clients can securely access system functions via a web browser, with no need to install application software. Multi-vendor support allows easy expansion through the addition of a growing choice of third party cameras and other devices to create a powerful, versatile monitoring system. Regular software updates give monitoring professionals the reassurance of top-flight performance and the addition of new features to expand system capabilities even further. Monitoring workflow is enhanced with support for a wide range of smart analytical and automation functions. This software-based solution gives system designers and integrators the freedom to select server hardware from the marketplace with CPU and operational specifications to meet their customers' precise needs. The SOW-S and SOW-E Series network video management software and HAW-S and HAW-E Series network video recorders are not compatible with each other and cannot be used in the same system. 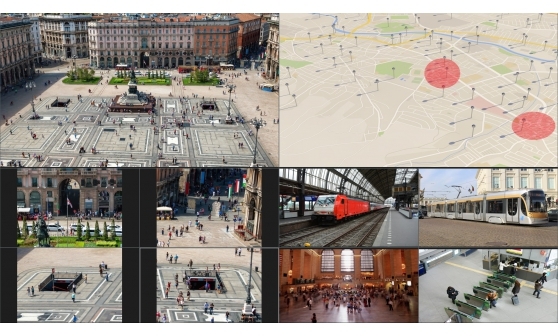 Sony 4K cameras provide powerful new ways to get the whole picture, allowing detailed analysis of specific areas in a scene, together with a wide-area situational overview. They offer a range of video output functions, including Intelligent Cropping and Multi Tracking, plus Evidence Shot, high resolution still image capture that’s ideal for evidence. The SOW-S Series supports the video output functions unique to Sony 4K cameras, including a single real-time 4K/30 fps video stream and Intelligent Cropping that provides a Full HD overview video plus up to four VGA close-up video streams at the same time. Multiple users can simultaneously and securely access live or recorded video via their smartphone or tablet from any location. In addition remote PC clients can securely access system functions via a web browser*, with no need to install application software. Live images captured with a smartphone or tablet by on-site staff can be transferred to the system, shared among users in the operations room and recorded to the central server. This supports timely monitoring of events, even in extreme environments where installing cameras is difficult. * Web browser supports limited functions, while client application software installed on a PC supports full system functions. Multiple monitors can be easily controlled by a single operator. The monitors are allocated to different tasks - such as viewing cameras images, a site map or alarm list - giving a single operator a complete overview and status of the entire system. Interactive, multi-layered maps offer a situational overview plus control of cameras and other integrated systems. Icons are displayed in a map image showing the location of each camera: operators can instantly view live video by clicking on an icon. When an alarm event occurs, the associated camera icon is displayed prominently, helping the operator understand the situation and take appropriate action. Toggle between Advanced mode and Simplified mode.